But I don’t. Who’s to judge our actions? Who’s to determine what’s right or wrong? Who’s to say what “one” should our shouldn’t do? In the end it all comes down to choice. The choices each and every one of us is making on a daily basis. Societies all over the world keep a balance of “appropriateness” by defining the shoulds of our daily interactions. But what if you and me would get up every morning and step into complete self-responsibility? For our thoughts, for our actions and for our lives? Approaching life like a blank canvas every day! I can only imagine what could be if we dropped all our internal and external shoulds. My imagination is a wild one though. I see a visionary and authentic world, one of shared responsibilities but also shared joy and true connections among people. We spend years and years (some people even their entire lives) to craft and color our masks that keep us “safe” in a picture perfect world. They fit perfectly like a second skin and they sure look good from the outside. But what’s to be protected? And what’s really at stake if you keep up this masked version of yourself? Your identity? Your authenticity? Your freedom? Your choice? Your self-determination? Your life? I don’t know your answer to this question but I do know mine: I am giving up my illusions. This is an unpleasant truth. But it is the truth. My truth. And that’s the only one that matters to me. You might have a different truth and that should be the only one that matters to you. Did you even notice the should in this last sentence? I didn’t until I reread it. Was I tempted to rephrase? Oh yes! But then I realized that would just be proving to myself that I am listening to my own self-imposed shoulds…I chose my own truth instead because I really believe that each and every one of us has the right and freedom to give the highest priority to our individual truth. Holding that belief creates a should in my mind. Whether or not anybody else accepts or challenges my should is a matter of choice again. But who am I to determine if this is not just another illusion? Writing this fills me with excitement and frustration at the same time. A deep longing and yearning for truth and authenticity is driving me to put into words what’s been on my mind for quite a while. But it makes me really sad to see how many people are caught up in their self-constructed illusions – including myself – missing out on a big part of life. Thinking about this, an image of a safety net comes up for me…but when I take a closer look I realize it’s not just a net, it’s a box. Sure, it will keep you from falling down but it will also hold you back from jumping. Only you can be the judge for yourself: Do I choose safety and very limited flexibility over my freedom of choice, authenticity and true self-expression? For the past few weeks I’ve been very determined to explore, find and speak my own truth. It’s tough! And I fail. A lot. But I also celebrate successes along the way. My illusionary truth shatters bit by bit but I am creating a new one every day, which fills me with joy and sadness. And I love this wild mixture of emotions and feelings. It challenges me to leave my comfort zone but this is where insight and growth can happen. I come across shadows, loyal soldiers, fears, insecurities and illusions – concerning myself, others and the world. It is a challenge – sometimes a very painful one. But after all it is my truth. And I choose to look at it. Completely unprotected but yet so safe in my own authenticity. How strange when an illusion dies. It’s as though you’ve lost a child. Categories: detachment, fear of change, happiness, illusion, life, truth, Uncategorized | Tags: fear of change, illusion, inspiration, Life, truth, vision | Permalink. This morning I hopped into the most colorful shower I have ever seen in my life. What a great start of the day! My daily showers have served me well in the past regarding inspiration about my writing and especially shampoo really seems to tap into my inspirational thinking. Here I was, squeezing my shampoo bottle, when this big realization hit me out of the blue. Sometimes we are so focused on lack and our fear of losing something that we do not even realize how much we have already. Our concern is in the past – that has passed – or the future – that’s not here yet and might never come – that we forget to be present here and now with what is and with what we have. Very little can take you a very long way! That is so applicable to anything in life. If my shampoo would not have lasted that long I could have just picked up a new bottle at the next store … or I might have come up with other ways to keep my hair clean 🙂 Either way, there are always options to choose from and just because something seems little it can serve a great purpose and be quite long lasting. So what am I taking away from this? My shampoo bottle 🙂 and a lot of trust that it might actually stay with me until the end of my trip. Overusing, overpacking, over everything seems to be the name of the game these days. We accumulate and pile up more and more stuff thinking it will bring us happiness. But what really happens is it burdens us because we have to take it everywhere we go and also adds a lot of worries to our lives because we are so afraid that we might lose what we accumulated over time. This trip has taught me how limited options actually serve you well in tapping into your creativity and are a great way of truly experiencing the moment. Happiness is in being content with what is in each moment, however little that may be. I know for sure now that I need very little to be very well and happy. Mahalo! Categories: fear of change, happiness, Inspiration, life, Mindfulness, simplicity, Uncategorized | Tags: fear of change, happiness, Life, mindfulness, simplicity, wplongform | Permalink. Only a life in freedom is a life well lived! I’m super thrilled and delighted that my guest article on dogmas and limiting sets of beliefs was published on the German blog “Geist und Gegenwart” today! Ich freue mich riesig darüber, dass mein Gastartikel zum Thema Glaubenssätze heute auf Geist und Gegenwart veröffentlicht wurde! Categories: change, dogmas, fear of change, Glaubenssätze, Purpose | Tags: change, dogmas, Glaubenssätze, purpose | Permalink. Polly the Parrot is quite a jolly fella. Colorful and chatty she is roaming her cage day in, day out. By doing what comes natural to her and what she knows best [parroting] she brings joy and entertainment to her “owner” Paul. Little does Paul know that in theory he is entertaining himself because after all Polly is just repeating whatever he says – but that’s a different story. Besides her repetitive qualities Polly has another ace up her sleeve: her great memory. This allows her to memorize all of Paul’s favorite words and phrases so she can recite them without even being asked for it. Quite an impressive parrot super power in Paul’s eyes, bringing him even more delight and joy. Polly never questions any of this. Why would she? After all she’s a parrot and this is what she knows: Repeat what others tell you and it will result in praise, admiration and food. That’s what a parrot’s life is all about. Polly’s choice is a different one though – she takes a stand for courage and steps into her power. Settling for ordinary mediocrity is no longer an option! So she spreads her wings, breaks the cage of limits and parrot beliefs and finally lives up to what her soul has already been telling her for a while: I’M AN EAGLE! The true nature of man is the one of the eagle, hovering without limits between heaven and earth […] But most people have turned into parrots. They sit in their cages unable to fly and repeat what they have been taught for the simple reason of being liked and fed.” ~ Matt Galan. Categories: change, fear of change, life, Motivation, Purpose, Uncategorized | Tags: change, fear of change, Life, motivation, purpose | Permalink. This post was inspired by the two little fellas to the left. The other day I was going for a walk along the river, which I usually do to organize my thoughts when I have a million things on my mind. 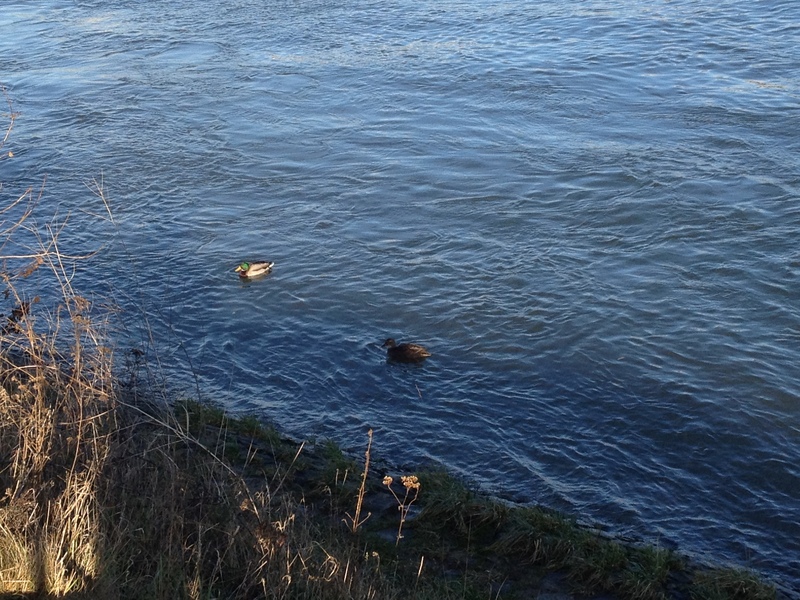 While I was taking my stroll I noticed two little ducks in the water so I stopped and watched them for a bit. Although I’m not an expert on the mating habits of ducks, I am pretty sure this was the duck version of a couple – male and female. Lets call them Donald and Daisy for simplification purposes. Why is it so hard for humans to do the same in a relationship? Once we fall in love with someone we come to think that we need to be physically and mentally close to each other at all times. As soon as a distance emerges between us we start questioning the whole relationship. In situations like that life tends to send us temptations – I call them “life’s special offers” – they usually appear out of the blue and would provide an easy fix for our problem at hand. Many people love sales and special offers so they go for it. After a while they realize that there was a reason for the bargain prize: bad quality, limited durability or it breaks right away…They regret the “purchase” and want to return the “item” but usually the warranty is up so they are either stuck with the faulty person item or without it because they disposed it right away. And this is when most people start regretting quick fixes and previous impulsive decisions. I think we can learn a lot from the two little ducks: Even if one of them maneuvers the waters much quicker, it would never leave the other one for a faster piece of driftwood. They trust that the other one will catch up at some point and enjoy the times when they swim side by side. And this is what people should do as well…instead of fussing about the differences and problems there might be in a relationship, the focus should be on similarities and trust. We put so much energy into “making things right” again according to our own definition and before we know it our ego and inner control freak is turning our relationship life into a living hell. If we’d just have more trust in life and would let go of the things that are not controllable anyway, we’d be much more peaceful and could save our energy for relevant and changeable visions and missions. Just because our pace of life doesn’t always go hand in hand we can still have a good foundation to build on. And when the time is right, our pace will come together again and we can enjoy a swim together… Two people will never have the same heartbeat…they can still dance to some groovy beats! Categories: change, fear of change, life, Love, Mindfulness, Relationship, Uncategorized | Tags: change, fear of change, flow, love, mindful, relationship, wplongform | Permalink. There is a little tray in my shower, which is actually way too small for all the things I keep on it. Since we moved into this appartment I’ve been developing a “stacking method”, which allows me to make all my showering utensils fit anyway: shower gel, shampoo, face wash, conditioner and a razor…Of course I also came up with a special order according to bottle sizes and shapes to come to the perfect arrangement. It worked for a long time and I was quite happy with my little set up. About a month ago I switched shampoos. Not a big deal as one might think but it shook my little tray arrangement to the core. Of course the new shampoo differed from the old one in shape and size…but I didn’t care and kept the order that I had been working on for so long to finally make it fit – more or less. I managed to put everything on there but I just couldn’t get it to stay! So every time I took a shower in the last couple of weeks at least one of the bottles (mostly the new shampoo) fell down but usually at least the face wash – sometimes everything else – dropped as well. As a result I found myself picking up all my shower utensils anywhere from one to five times while showering. 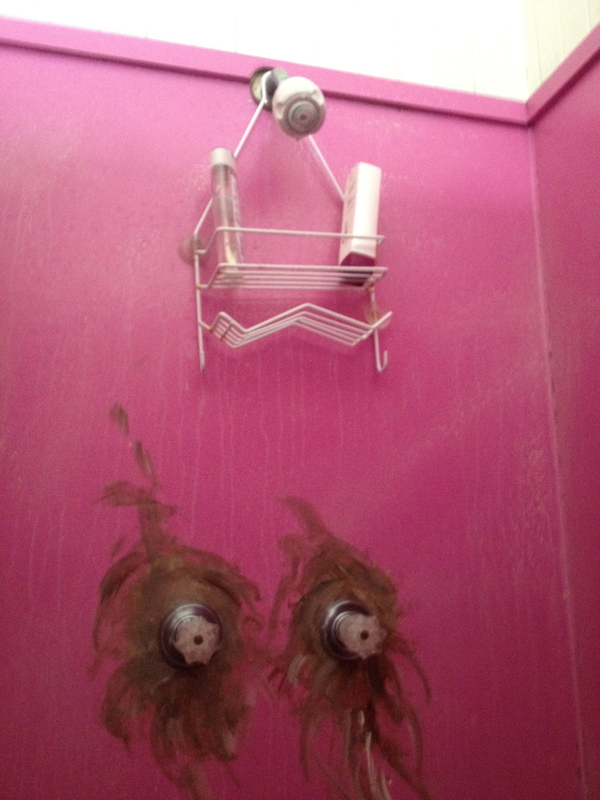 The shampoo (and face wash and shower gel and razor) kept falling and I kept picking it up…over and over again. Of course with every time I reached for the things on the ground I got a little more furious, impatient and annoyed. While taking a shower today the falling down routine started again and when I was just about to get down to pick up my shampoo it hit me: The new shampoo just doesn’t fit with the old order! Why had this taken me over a month to realize? So I took “action” and changed the ‘face wash behind shampoo order’ to ‘shampoo behind face wash’ and with a little change like that I had not only restored but even improved stability on the tray! My little shower story got me thinking. The more I thought about it the more it resembled common life issues for me. We grow up in set structures with predefined values / aims and we start to arrange our lives accordingly. At some point these structures or values might start to shift due to external circumstances or maybe because we start questioning our old beliefs and start developing new ones. Either way one or several parts of this little ‘puzzle’ go missing, change shapes or new parts come into the picture. So what happens? The entire ‘puzzle’ arrangement changes and some parts just don’t fit anymore but we try EVERYTHING to make them fit anyway. We try so hard that we start bending pieces or leave them out because we want to keep the old arrangement. We liked the old ‘puzzle’, we had known it for a long time, it was pretty to look at and most importantly we knew every little detail by heart – no (unpleasant) surprises. The more we try to use the new parts for the old puzzle the more we break it; the pieces we have at hand are just not made for the previous order. Unless we switch perspectives and accept change as a good and necessary thing that keeps life flowing we are stuck with a stubborn attempt to keep the status quo. Once acceptance takes place and we look at the new situation from a different angle we realize that the new ‘puzzle’ is just as pretty as the old one – maybe even prettier. It didn’t take any effort to put together because for the new ‘puzzle’ we had everything we needed: perfectly fitting pieces. But as long as we desperately fight change and try to keep things as they are we will find ourselves in an endless struggle. Change is a scary thing for a lot of people. I never thought I was one of them because I usually crave new experiences and unknown situations. However, my little shower incident today made me realize that there is (at least a little) fear of change in everybody, even when it is just about keeping the order on your shower tray! Categories: change, fear of change, life, Mindfulness | Tags: change, fear of change, Life, mindfulness | Permalink.